The Stooges prepare Mary her breakfast and deliver it to her home. All right, time to talk about those loveable wise guys: The Three Stooges. Due in a large part to my father’s influence on me as a child, I have a fondness for The Three Stooges that would likely rival any fan. I own every episode and have watched them countless times. I liken them to my television “soul food.” So, with the stress of my impending graduation mounting, I’ve turned to Moe, Larry, Curley (occasionally Shemp—Joe is avoided at all costs because I don’t consider him a “real stooge”) to calm my nerves. Enter “Hokus Pokus” a 1949 episode where “a neighbor’s plan to use the unwitting stooges to her scam to defraud an insurance company backfires” (taken from The Three Stooges Collection Volume 6: 1949-1951). To make a short story shorter, Moe, Larry, and Shemp painstakingly/painfully make breakfast for Mary, bring it to her apartment, set her up, meet the insurance adjuster and go off to work to hang advertisements. While at work, they meet a hypnotist, Svengarlic, who hypnotizes them into walking out onto a flagpole of the building Mary is in. When Svengarlic is knocked unconscious, The Stooges awaken from the trance, hop into the nearest window and frighten Mary so badly that she jumps out of her wheelchair in shock, just before the insurance agent hands her the check for $25,000. While this episode isn’t necessarily the “be all, end all” in representation of disability in pop culture (is it still pop culture if the “pop” in reference was 63 years ago?) 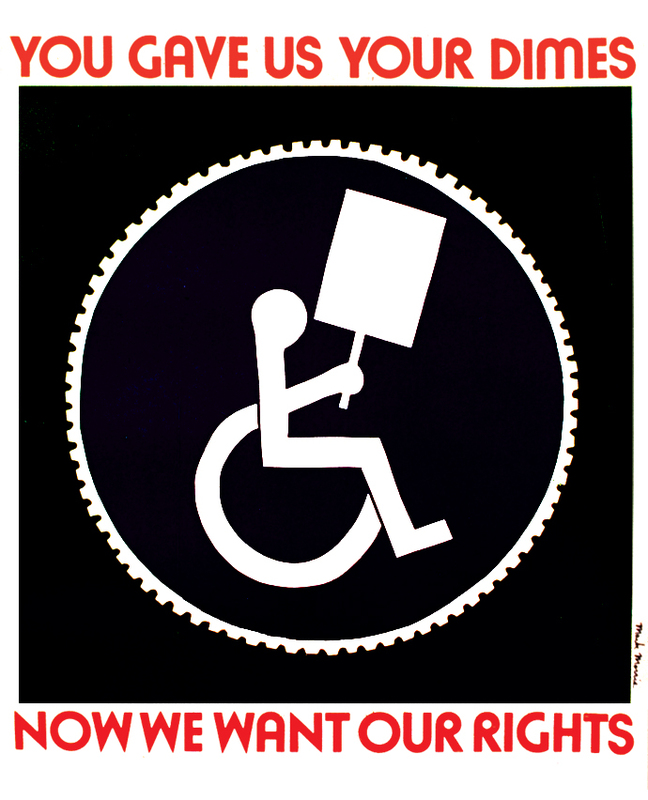 it does highlight some very interesting cultural conceptions and anxieties regarding people with disabilities that were relevant at the time and certainly relevant contemporarily. This short episode highlights a cultural anxiety of people with disabilities being a drain on societal resources ($25,000 was a good chunk of change back then). The fact that Mary is faking her disability also contributes to the notion that people with disabilities aren’t trying hard enough, are complainers, are only looking for a handout, and could be “productive” members of society if they just tried hard enough. Despite the fact that the episode is made with comedic intentions, it utilizes tired and true cultural scripts regarding the representation of people with disabilities nonetheless. One reason the audience could find the episode amusing is because of the way it encourages viewers not only to set themselves apart from those “cheaters/drains” on “the system” but also that the good guys win and the deceivers get what’s coming to them. 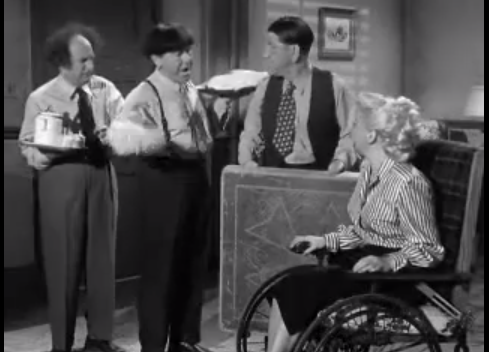 In it’s most basic sense the brief storyline could be boiled down to “good trumps evil”—in this case the “good”=the (able-bodied) Three Stooges and the “evil”=the deceitful wheelchair user. Food for thought? I think so. Ok, another audiobook-related post. I rather enjoy these relatively shallow murder mystery books called “The Hannah Swensen Mysteries” by Joanne Fluke. (In case you’re wondering, the books are centered around Hannah Swensen, who owns a cookie shop/bakery and somehow gets mixed up in murders that occur in her small town of Lake Eden, Minnesota.) I’ve read a few of them (not in order) and have recently been listening to the audiobooks to fill in the gaps of the ones I’ve missed. Just this morning I was listening to the second installment in the series, The Strawberry Shortcake Murder, while in the shower. In this particular scene of interest, Hannah and a friend of hers are developing some film (that is a crucial piece of evidence in a murder investigation!) in a darkroom. Her friend, Norman, needs to turn off the lights to submerge the film rolls and warns Hannah that it’ll be dark. The lights go off and the narrator reflects: “Sounds seemed to be magnified in the darkness… She felt a bit disoriented now that she could no longer judge the dimensions of the room by sight. She reminded herself that this must be how blind people felt and gave thanks that she wasn’t sightless” (112). Really Hannah? Or should I ask, “really Joanne?” It’s exhausting how disability (and sensory impairment in particular) are portrayed in such a one-dimensional manner. Obviously Hannah can’t comprehend the experiences of the blind/vision-impaired by just turning out the lights, but she thinks she can. What does this say about our social and political environment? It’s strange to think that blindness is thought of as the inability to see anything—like walking around in a darkroom. And it’s equally strange to think of someone using it in such a cursory manner. She mentions it, gives thanks she’s not “one of those people” and goes about living her able-bodied life. The ways that the complexities of human experience are simply glossed over in many books and films is disheartening. This one-liner left me feeling frustrated and let down. It’s such a small line but is symptomatic of such a larger issue. Citation: Fluke, Joanne. 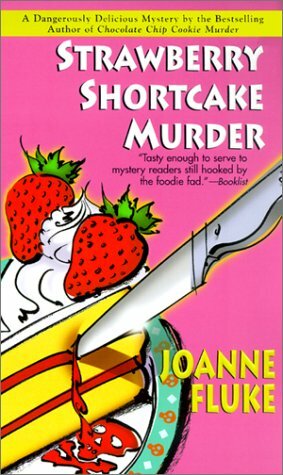 The Strawberry Shortcake Murder. New York: Kensington Publishing Corp, 2002. I just wrote my M.A. exams this past weekend, so please excuse the recent wane in my blogging. I feel like I’ve dedicated nearly every moment of “free time” I’ve had in recent weeks preparing for them by reading new material, organizing notes, etc. Now that it’s over I feel a huge sense of accomplishment. I’m proud of the work I produced and my examination of feminist disability studies (my “specialty”). So here’s what I wanted to say after going through this process and writing four essays in three days. I love feminist disability studies. I think if I can go through this process and emerge from it feeling not only “whole” as a scholar, but reinvigorated about the work that I’m doing is very telling. I loved braiding together not only the concepts offered by different contributors to the field, but also developing my arguments based upon their groundbreaking contributions. I’m completely exhausted right now and am going to grab a quick coffee (which I never drink because caffeine makes me extremely jiggery, but I’m going to put up with the side effects to stay awake for a few more hours) because I have to teach a class in an hour and a half… but I wanted to quickly reassert my commitment to this fabulous burgeoning field. After teaching, I’m planning to sleep for the next 18 hours or so, but then it’s back to reading, writing, and doing what I can to contribute to academic, political, and social change. “God’s love – Evol’s dog” – Adah. 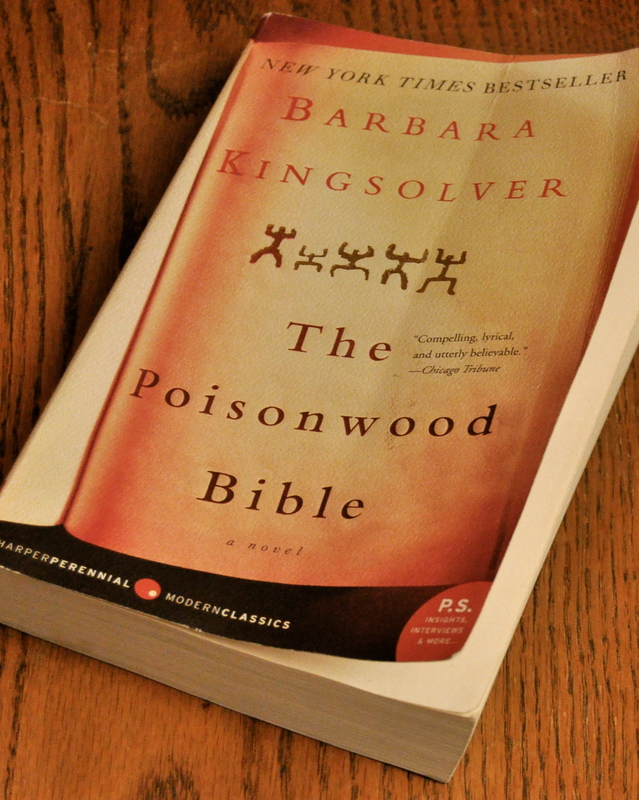 Recently, I’ve been “rereading” The Poisonwood Bible by Barbara Kingsolver (as I’ve mentioned before, this means listening to it on audiobook while I go about my daily activities) and was struck by the way it explores disability-related issues. The story is told by the wife (Orleanna) and four daughters (Rachel, Leah, Adah, and Ruth May) of Nathan Price, an evangelical Baptist minister who takes his family to the Belgian Congo in 1959. Adah has “hemiplegia” – which she explains breaks into “Hemi – is half, hemisphere, hemmed-in, hemlock, hem and haw. Plegia is the cessation of motion” (34). So it is, she says, that her “right side drags. [She] was born with half [her] brain dried up like a prune, deprived of blood by an unfortunate fetal mishap” (33). While she and her family describe her as working with half her body, as well as half her brain, it is clear throughout the book, that she has extreme insight and intelligence. Aware of this fact, she closes her first chapter of the book by writing, “It is true that I do not speak as well as I can think. But that is true of most people, as nearly as I can tell” (34). But once Adah and her family arrive in the Congo, the Congolese stare at all of them, particularly Rachel, who is nicknamed the “white rabbit” because she is so extremely blonde and pale, or “mvula” – the Congolese word for termite (52). Six-year-old Ruth May writes, “Adah was the only one of us in our family with something wrong with her. But here nobody stares at Adah except just a little because she’s white. 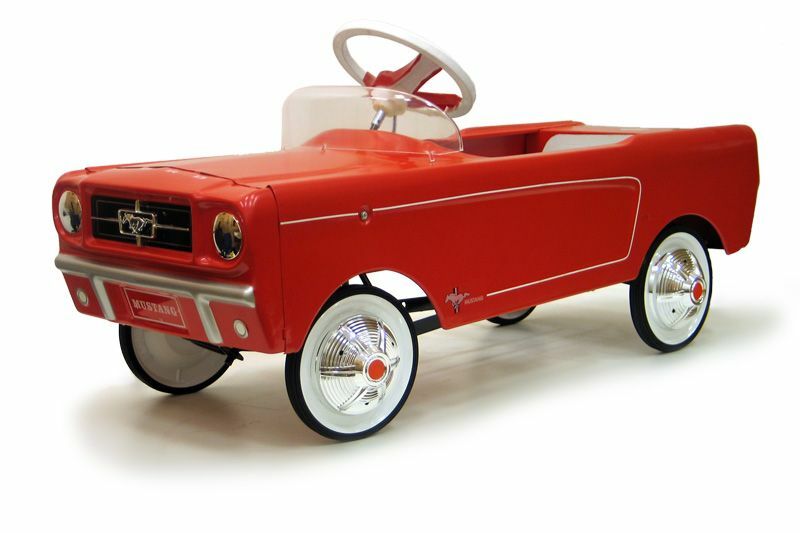 Nobody cares that she’s bad on one whole side because they’ve all got their own handicap children or a mama with no feet, or their eye put out… they’ll wave a stump at you if they’ve got one, in a friendly way” (53). In an interesting paradigm shift, it isn’t physical “abnormality” that sets any one member of the Price family apart, but the whiteness of their skin that “otherizes” them all. The way that disability is described as an accepted part of the human experience in Kilanga is striking. The varying body types and physical attributes aren’t even considered on a spectrum of disability/ability; instead, diverse body types are simply accepted. When Nathan remarks to Orleanna that the body should be treated as a temple, she responds by saying, “Why, Nathan, here they have to use their body like we use things at home—like your clothes or your garden tools or something. Where you’d be wearing out the knees of your trousers, sir, they just have to go ahead and wear out their knees!” (51). And so it is, that the people of Kilanga all seem to have varying types of bodies for one reason or another. Mama Mwanza, the closest neighbor of the Price’s became a double amputee after her house caught fire and part of her roof fell on her legs. But, as Ruth May writes, “she goes right on tending after her husband and seven or eight children. They don’t care one bit about her not having any legs to speak of. To them she’s just their mama and where’s dinner? To all the other Congo people, too. Why, they just don’t let on, like she was a regular person. Nobody bats their eye when she scoots by on her hands and goes on down to her field or the river to wash clothes with the other ladies” (52). I appreciate the way Mama Mwanza’s physical difference is described in sincerity by Ruth May and the way that the Congolese in the story do not take particular heed to the way that Mama Mwanze (or numerous other members of the village) is physically diverse. Indeed, not only is Mama Mwanza a steady character throughout the book, but she takes special care of the Price family in several instances, such as by secretly putting eggs under their chickens so they do not starve and showing them which plants are dangerous. Her character is written in a way that does not evoke feelings of sympathy and she and her family are not portrayed as charity cases. Also, she is not shown as “the brave victim” or as a “supercrip” who valiantly overcomes or overcompensates for her condition. Instead, she is depicted as all of the other Congolese people are: trying as best they can to get along and sharing/caring for those who are less fortunate (which, at times, means the Price family). But then the issue of disability gets more complicated. Jump ahead about 400 pages and Orleanna and Adah are back in the United States. Adah is attending medical school at Emory and has befriended an “upstart neurologist” who insists that “there should have been complete compensation in the undamaged part of [her] cerebral cortex, and that [her] dragging right side is merely holding on to a habit it learned in infancy” (439). Adah is thus convinced to clear her “nervous pathways of so-called bad habits” and stops walking entirely for six months in order to do so (439). 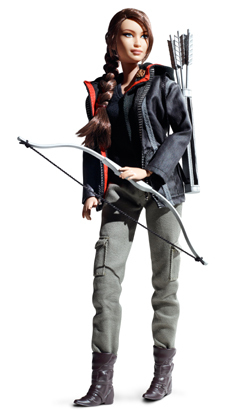 While skeptical at first, Adah soon feels “the snap like a rubber band that drew [her] right leg up under [her] as [her] left arm moved forward” (440). After many years apart, Rachel and Adah meet in person and Rachel is amazed how Adah “has truly had a miracle recovery” (476). So, what gives? How does this incredible paradigm shift occur both in Adah and the book as a whole? We go from valuing human diversity to “fixing” it through the American medical institution? It’s proven that the only thing “wrong” with Adah is that she developed some “bad habits” as a child and never grew out of them? What a let down. In all honesty, I’m still completely shocked at the turn of events in the last portion of the story and can’t quite reconcile them with the ways that disability was originally introduced. I know I’m really asking more questions here than I’m providing answers for. I’m going to keep thinking about it, because right now, I feel like I’m missing the “bigger picture” for why the book and Kingsolver are editing the way that physical diversity is portrayed. Citation: Kingsolver, Barbara. The Poisonwood Bible. New York: HarperCollins, 1998. Print. It’s been awhile since I’ve read Mark Haddon’s The Curious Incident of the Dog in the Night-Time, but I’ll be reading it again in a few weeks for my class, so look out for another post about the book itself then. In the meantime, today’s been a rough day for me. It’s been one of those days where nothing seems to go my way and everything I’ve tried to do has been thwarted in some way. Nothing big, just a combination of things going on in my life that was making me feel like I was a pot ready to boil over. I can’t quite remember Christopher’s rationale from The Curious Incident about why the more red cars that are in a row, the better the day will be, but I did remember the “Black Day” rationale. Christopher didn’t like objects (cars, food, etc.) that were brown or yellow because that’s the color of excrement. And I agree. So, in that moment when I was pulling out of the parking lot and saw all those red cars sitting together in a row I thought, “This is the turning point for the day. You can either let what’s done continue to shape the outcome of the rest of the day or you can get over it and let it be a Super Good Day despite the excrement that’s happened to you.” While it didn’t turn out to be a Super Good Day, it certainly didn’t continue as a Black Day, and that’s all you can really ask for, right? 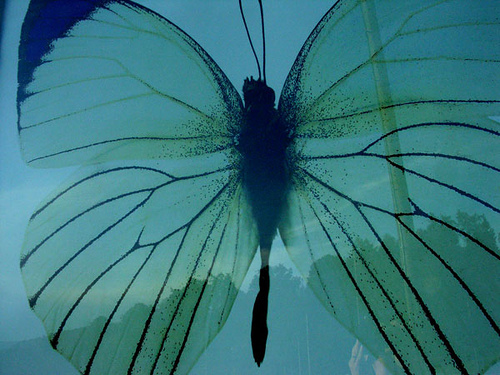 I’ve read The Diving Bell and the Butterfly by Jean-Dominique Bauby a few years ago, but just re-read it this past week. In our Language and Literature class we talked about how some critics have put it in the “nostalgic” camp of disability memoir, but I don’t feel 100% confident in doing so. It’s not that I think “I should count my blessings” or “things could be so much worse” after reading it. But I do feel like Bauby conveys of sense of magic through his prose that I don’t often feel from other works. It’s the type of magic that makes me appreciate sitting at the library and grading 38 of my students papers with a friend, or taking a walk with my dog at the park and chatting with the other doggie people. In all honesty, I’m sure this feeling will fade with time (in all likelihood not very much time), but for the past few days I can’t help going about my daily business thinking, “I’m going to look back on this moment years from now and treasure it”… so why not treasure it now? I’ve always hated that cliché saying, “live every day to the fullest” or “live every day like it’s your last” because they’re terrible. If I were to really live my life like that, I’d have no motivation to make my bed in the morning, go grocery shopping, eat anything but pizza and Oreos, and would call my parents every few minutes to tell them I love them. But I do think there’s something to be said to finding the beauty in every moment and cherishing it. Bauby’s chapter entitled “The Duck Hunt” is my favorite because he talks about how another little patient is lucky to have been discharged from the hospital because Bauby was about to “carry out [his] plan to exterminate the duck.” Even though the duck is just a bothersome toy that quacks when a visitor enters the room, Bauby creates a whole chapter surrounding it and the lengths he would apparently go to to silence it. I like the notion of thinking of events in my daily life as mini-adventures that I could novelize. I was once told not to get stuck wishing for the future. We have a tendency “to get through” the present by thinking ahead to the future and not living our lives in the here and now. So, for me, that could be thinking “next quarter I’ll have fewer students” or “next month my pool will be open and I can grade papers next to it.” This type of thinking is obviously to the detriment of thinking “having so many students is positive because they articulate multiple perspectives” or “even though my pool is closed, I can still go to the park and sit on a blanket in the sunshine with my dog while I grade papers.” So, in a somewhat different way, I think Bauby’s text encourages readers to have this appreciation. Who thinks about the enjoyment of the luncheon ritual? Bauby does. And so should we all. There are so many little pleasures in life that seem to get lost when we’re busy thinking about the bigger ones. I’m trying to enjoy the little things just as much as the big ones because, honestly, wouldn’t I be a happier person by doing so?